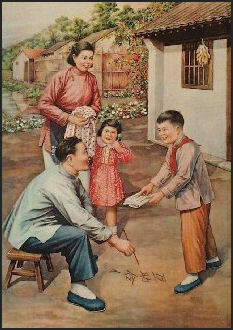 Mao-era literacy poster The population of China has become more educated and literate under the Communists. Literacy rates have jumped from around 20 percent when the Communists took over in 1949 to around 91 percent today. But that means that 85 million Chinese still can’t read and write. Low education levels have traditionally been obstacles to China development. In many rural areas people who could read or write and had a middle school education were regarded as wise and educated and people who had a high school education and didn’t do manual labor were considered intellectuals. These conditions continue to exist in the countryside while people in the cities are becoming more educated. These days there are many Chinese with university degrees who have attended university abroad. Based on the performance of students in top high schools and universities, Chinese students “overwhelmingly” outperformed students in both Japan and South Korea on mathematics, science and English tests. Japan and South Korea usually do very well in international mathematics, science and English tests. According to the 2010 census, the proportion of college-educated Chinese went up from 3.61 percent in 2000 to 8.93 percent. In 1998, when Jiang Zemin, then the president, announced plans to bolster higher education, Chinese universities and colleges produced 830,000 graduates a year. In May 2010, that number was more than six million and rising. 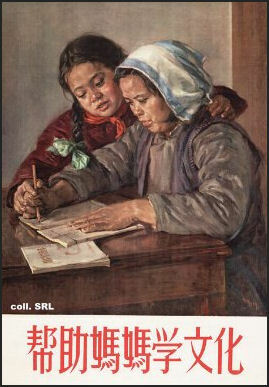 Mao-era literacy poster Adult literacy rate: 86.5 percent for females; 95.1 percent for males (compared to 34 percent for females and 64 percent for males in India; and 99 percent for males and females in Russia, the United States, Japan and much of Europe). Literacy in China is defined as being able to read and write 1,500 Chinese characters in rural areas and 2,000 in urban areas---a fraction of the 7,000 to 10,000 required of university graduates. To read a newspaper one needs to know around 3000 characters. 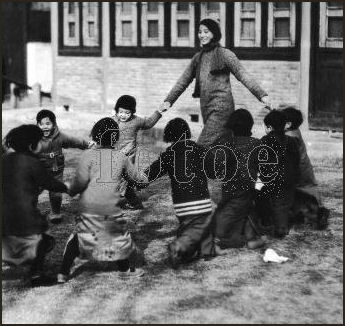 The Communists were able to reduce illiteracy by launching education programs and simplifying Chinese characters. Many of China's illiterates are old people or people who missed the chance to get an education because of the Cultural Revolution when children didn’t have to go to school. China has developed some novel approaches to combat illiteracy. In the villages of Wiping County in Henan Province in central China, visitors who can not read a few characters on blackboard outside of villages are not allowed in. As a result many illiterates have enrolled in special reading classes offered in the village. After a 50 year campaign illiteracy was declared nearly wiped out in 2000. The number of illiterate people reached an all time low of 87 million in 2000 (around 9 percent of the population). “Retaining literacy was as much a problem as acquiring it, particularly among the rural population. Literacy rates declined between 1966 and 1976. Political disorder may have contributed to the decline, but the basic problem was that the many Chinese ideographs can be mastered only through rote learning and are often forgotten because of disuse. Since 2000 illiteracy rates have risen. Between 2000 and 2005 the number illiterate Chinese increased 33 percent from 87 million to 116 million, wiping out progress that had been made over the previous decades. China accounts for roughly 12 percent of the world’s illiterate population. The increase in illiteracy was blamed on increasing numbers or rural poor dropping out of school to find work in the cities and the high cost of rural education. As signs of progress the government points to higher class enrollment figures in primary and middle schools and the fact that 10 million adults were taught to read and write in adult education. But statistics are misleading. People who are functionally illiterate can often pass tests that are supposed to measure literacy and the way literacy statistics are gathered is a little suspect. Literary is defined according to an exam taken in the fourth grade. Those that pass the exam. often don’t pursue their education any further. Having no reason to read and write they forget their skills, This is especially true among ethnic minorities. Illiteracy rates are particularly high among village women. Many village women are too tired from chores to attend literacy classes. 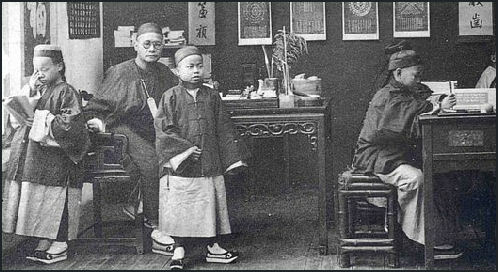 Chinese school in 1901 There is a strong emphasis on education in China and Asia. Stanley Karnow wrote in Smithsonian magazine: "Like other Asians, who traditionally revere scholars, they value learning. They also see education as both the path to success and consistent with their sense of filial piety, the way to bring esteem to their family." The Chinese education system encourages conformity and is adult driven and super-competitive. Students have traditionally been expected to be diligent, silent and obedient. The word "jiaolu" is used describe the stress and anxiety of everyday life and pressure to study in China. A survey by the China Youth Daily found that 66 percent of young people felt they were under heavy stress. Only one percent said they were stress free. Parents also feel pressure. Mainland parents and teachers believe in starting education early. Mothers say they wouldn't dare to free their child from cram courses because "everybody else is doing that and nobody wants to be left behind". Education is seen as a family effort requiring a great deal of sacrifice, time and money. It is not unusual for families to sell their houses and go into massive debt to send their children to university. Parents watch over their children carefully and guide and direct them. At an early age children are taught to memorize their textbooks. By Kindergarten they are attending a wide range of music, art and calligraphy classes. Some of this is in step with Confucian ideas of “self-perfection” and the Maoist notion of “all-around development,” with emphasis on practice, practice, practice. One of the hottest selling books in the early 2000s was Harvard Girl. It was written by parents who described how they prepped their little girl, beginning when she was an infant, to succeed at a America’s most prestigious university. The book's success inspired a dozen or so imitations: Harvard Boy, Cambridge Girl, Our Dumb Little Boy Goes to Cambridge and Tokyo University Boy. In many rural areas, children only attend primary school if they attend school at all and often stop going after three or four years. Some rural schools do not extend past the third grade. It is not unusual for a district with thousands of school age children to have fewer than a hundred actually in the local school, with only a handful finishing the six grades. Textbooks are in short supply and have been so heavily used the paper is sometimes cracking and transparent with age. 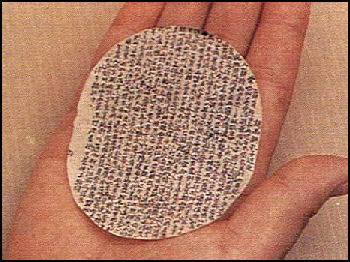 Paper, pens and pencils are also in short supply and children often write on slates with broken pieces of chalk. Many villages build their own schools and then ask the government for a teacher. Classes are often taught in local languages which are little value in the major cities where most of the jobs are and other languages predominate. Like parents around the world, poor villagers want their children to succeed in school, but the obstacles just to get them enrolled are enormous. Even though schools are free, the books and clothes required to attend are so expensive they can eat up as much a third of the villager's income. A family that grows a cash crop may bring in $120 a year after expenses for fertilizer and pesticides while schools charge $75 a year per student for uniforms and books. Since most families average between four and eight children, even with father working odd jobs, there is usually only enough money to send two or three children to school at the most. In many cases, children go to school and learn to read but fail to improve there lives. Even students that are bright and privileged to attend university find there are no jobs waiting for them when they graduate. The basic principal behind Confucian education is that if you work hard, endure and suffer as a young person you will reap rewards later in life. The strategy of Confucian education, used in China for centuries, is to memorize the moral precepts in the hopes that they will rub off and improve the character of the person who memorizes them and makes him or her more moral. Teachers have traditionally been held in high esteem and their power and control has been regarded as almost absolute. Scholar-bureaucrats civil servants who ran the Chinese imperial government are known in the West as Mandarins (a term coined by the British). They were China's best and brightest, and served the emperor in the imperial court and as imperial magistrates and representatives in the hinterlands. Civil servants were recruited and promoted through a series of examinations. These tests were, theoretically at least, open to anybody and were responsible for a considerable degree pf social mobility. Success could bring privileged status and wealth to even the most humble born. The Chinese Civil Service Exam was essentially a test of knowledge of Confucian texts. For 2000 years, up until 1905, the heart of the exam was knowledge of the Four Great Books and Five Classics of Confucianism, including Confucius's Analects, the Book of Mencius, the Great Learning, and the Doctrine of the Mean. Test takers were given a certain amount of time (sometimes six weeks) and they were supposed to write everything they knew. Ideally, the students with the best scores were chosen for the best positions in the bureaucracy. There were local, provincial and palace exams and they covered a number of topics, including poetry, philosophy, politics and ethics. Passing was said to be more difficult than getting into Harvard. Stephen West, a Chinese literature professor at Berkeley told U.S. News and World Report, "The magnitude of their accomplishments is impressive. It would be as if a Henry Kissinger was a gifted poet. Or if W.H Auden was also a superb government policy specialist." Preparations for the test usually began around age five when young boys were taught to bow respectfully and recite lines from classical texts. The most promising teenagers were sent to study under masters in the Chinese capital. They were taught poetry, essay writing and Confucian scholarship. Many students failed the exams. In the year 998, only two students passed the highest, or jin-shi test. Scholars sometimes cheated on the civil service exams by writing down answers on a special shirt worn under their robes. There also many stories in Chinese literature of promising students who failed on the test because they were corrupted by women and alcohol. The notion that the Confucian system was based totally on merit and lacked a hereditary element is not true. 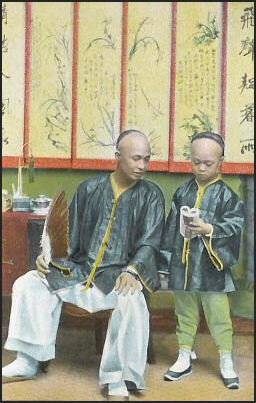 Children of merchants, landowners and families with money had an advantage in that their parents could hire tutors to teach them how to properly write Chinese characters and study Confucian texts. Once they attained their position, Confucian gentlemen made sure their sons studied the classic and was prepared for the exams. In response to Uy’s comments Andrew Field, a Shanghai-based professor wrote, “It's nice to see alternative points of view from Chinese people about education in Shanghai or other parts of China. Yu Zhibo's responses are interesting, but I think he's off target. Yu tells Mainland parents to "not give their children pressure" and let them excel in what they are already good at. This strikes me as pretty weak advice, since it isn't the parents alone, but the entire system that puts the pressure on the kids. As I've already mentioned in previous posts, my daughter is in first grade in a local school here in Shanghai. We get phone calls on a regular basis from my daughter's teachers about her performance. There's a lot of social pressure as well, and the teachers themselves are under tremendous pressure to enhance their students' performance. So telling parents to take it easy on their kids is not a real solution. Funny advice from a Harvard MBA...The only solution to changing China's current educational system is to reform the system from the top down so that it doesn't emphasize rote learning and test taking as much, but as anybody here knows, that is not likely to happen any time soon.